If you need to debug a WCF Server, or somehow need to step into code on IIS, you will need to do the following to prevent the message “Unable to automatically step into the server. Unable to determine a stopping location”. The message might be slightly different but generally it means you can't debug in IIS! 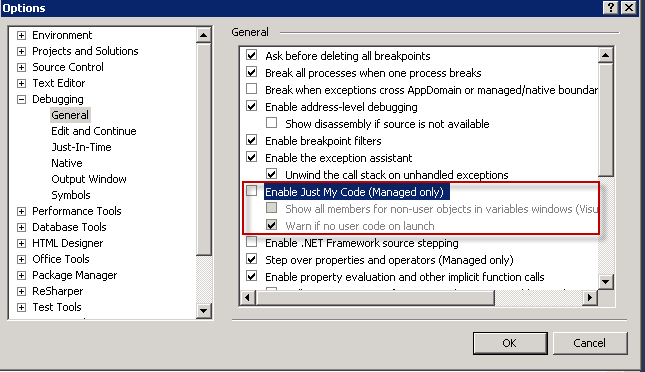 It turns out that Visual Studio 2010 comes with a default setting to debug ‘Just my code’. To correct the problem, go to Tools – Options – Debugging – General and switch off the option ‘enable just my code’. And of course don’t forget to set debug="true" in the web.config file of the webservice. Double check your publishing Transformations too if using any, as that might be removing the debug="true" property in your web.Config file. This will hopefully help someone else out there!